FAYETTEVILLE, Ark. 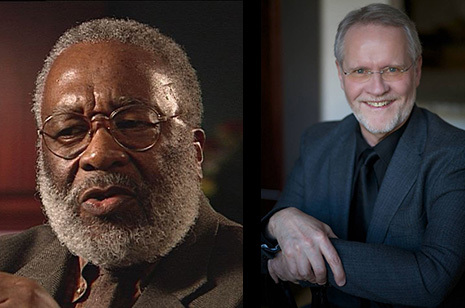 – Two men who have improved their worlds in distinctive ways – one a civil rights leader and non-violence advocate; the second an innovative voice teacher – will receive honorary doctorates from the University of Arkansas during the fall commencement ceremony. Vincent Harding worked alongside Martin Luther King Jr. in the non-violent struggle for civil rights in America during the 1950s and 60s. Harding remains an active voice for freedom and non-violence, as he demonstrated during a panel discussion with His Holiness the Dalai Lama and Sister Helen Prejean at the University of Arkansas last year. W. Stephen Smith is an Arkansas native, a distinguished U of A alumnus and a professor of voice at Northwestern University. He has achieved international acclaim for developing a new approach to teaching the art of singing, putting an emphasis on individual creativity and expression. Harding will receive an honorary Doctor of Humane Letters. Smith will receive an honorary Doctor of Arts and Humane Letters. “These two men have both worked successfully, in very different areas, to make the world a better place for current and future generations,” said Chancellor G. David Gearhart. “Vincent Harding played a vital role in the civil rights movement, and he has remained steadfast over succeeding decades in his advocacy of nonviolence as a viable, moral avenue for seeking social change. “Steve Smith is a U of A alumnus who has revolutionized the way students are taught to sing. The effect of his innovative approach is to enable these artists to realize and freely express their individual voices. Harding and Smith will both address the graduating students as part of the commencement ceremony. This is the second fall commencement since the university re-instated the ceremony last year, at the request of students. The ceremony will begin at 9 a.m. Saturday, Dec. 15, in Barnhill Arena. An estimated 700 students will be eligible to graduate at the end of the fall semester. Vincent Harding is perhaps best known as the man who created the original draft for Dr. Martin Luther King Jr.’s 1967 speech opposing the Vietnam War and putting forward the spiritual, social and economic foundations for that opposition. For Harding that speech was a central event in a life devoted to non-violent action, civil and human rights advocacy and transformative education. Harding’s commitment to non-violence crystallized in 1953 when he was serving as a draftee in the U.S. Army and realized that he was really a conscientious objector to war. Before being drafted he had received his Bachelor of Arts from the City College of New York (1952) and his Master of Arts in journalism from Columbia University (1953). After his discharge from the Army he went to study history at the University of Chicago and became associated with the Mennonite Club, one of the American “Peace Churches.” Harding served on an interracial pastoral team at the Woodlawn Mennonite Church on Chicago’s South Side; he also earned his M.A. in American history at the University of Chicago (1956). Harding traveled through the south as part of an interracial group of men from Woodlawn in the fall of 1958. On that journey Harding first met Dr. King in Montgomery, Ala., and King urged him to move south and join the civil rights movement. Harding maintained his commitment to education and in 1965 he earned his doctorate in history from the University of Chicago. The same year he joined the faculty of the history department at Spelman College in Atlanta. After King was assassinated in 1968, his widow, Coretta Scott King, asked Harding to help organize the Martin Luther King Memorial Center. Harding served as the center’s first director. At that time Harding resigned his academic position at Spelman, but he also began working with a group of African American scholars, artists and community organizers in Atlanta to develop and direct The Institute of the Black World, a path-breaking model for the black studies movement then emerging in America. In 1974, Harding, his wife and two children, Rachel and Jonathan, moved to Philadelphia, where he taught at the University of Pennsylvania and Temple University. He and Rosemarie also served on the staff of the Quaker-sponsored Pendle Hill Study Center before joining the faculty of the Iliff School of Theology in Denver in 1981. Harding taught there for 23 years before retiring. He is currently Professor Emeritus of Religion and Social Transformation. Vincent Harding is a major historian of the African American struggle for freedom, and has written several books on the subject, including There is a River: The Black Struggle for Freedom in America (1981); Hope and History: Why We Must Share the Story of the Movement (1990); and Martin Luther King: The Inconvenient Hero (1996). In 1986 Harding served as senior academic advisory for the PBS documentary Eyes on the Prize, an award-winning account of the civil rights movement. Harding and his late wife Rosemarie co-founded the Veterans of Hope Project in 1997 as an educational initiative intended to film the autobiographical stories of dozens of women and men who have devoted themselves to the work of compassionate social change, and to share those narratives with a younger generation. In May 2011, Harding visited the University of Arkansas, where he took part in a panel discussion with the Dalai Lama and Sister Helen Prejean: “Turning Swords into Plowshares: The Many Paths of Non-violence.” While on campus Harding also led a seminar on non-violence for faculty, students and guests. William Stephen “Steve” Smith was born and grew up in Corning, Ark., and received his bachelor’s degree from Harding College. He earned a Master of Music degree from the University of Arkansas in 1975 and a Master of Performing Arts degree in opera from Oklahoma City University in 1981. Smith has had a distinguished career as an artist, performing more than 40 roles in opera and musical theatre. He is best known in the music world, however, as an innovative voice teacher. During his 36-year career as a voice instructor Smith has developed a revolutionary approach to the way that voice students are taught to sing. Traditional voice instruction focuses on the techniques required to produce a beautiful, full volume sound, with creativity a secondary concern. Smith’s innovation is to take each singer’s unique physiology into account and allow them to develop the freedom to communicate expansively and spontaneously, producing a full and beautiful sound without having to continually monitor their technique while performing. Smith distilled and explained his teaching method in his book The Naked Voice: A Wholistic Approach to Singing, published in 2007 by the Oxford University Press. It is currently in its sixth printing and is considered a seminal work on the subject. Smith has taught voice at a wide number of institutions during his career, including Oklahoma Christian College, Moore’s School of Music at the University of Houston, the Houston Grand Opera and Aspen Music Festival. He has also taught students in his private studios. In 1998 he joined the faculty of the Juilliard School, where he taught for 13 years. In 2011 he became a professor of voice and opera at the Bienen School of Music at Northwestern University. Smith has dozens of former students who are performing professionally at the major opera houses around the world. He received a Distinguished Alumni Award from the University of Arkansas in 1999.